Dinelson (Hernandez) Lamet...his all-time favorite baseball player is Pedro Martinez...his favorite TV show is Reimon y Miguel and his favorite movie is Acción y Chiste...enjoys listening to Antony Santos...originally signed by Padres scouts Randy Smith, Felix Feliz, Emenegildo Diaz and Jose Salado. Dinelson Lamet (pronounced dee-NEL-son luh-MET) missed the entire season after undergoing season-ending Tommy John surgery in April. Split the season between El Paso (AAA) and SD, making his MLB debut on 5/25 at NYM... Became just the 18th rookie in Padres history to make at least 20 starts in a season…besides Luis Perdomo's 20 starts in 2016, the last Padre rookie to make 20-or-more starts was Justin Germano in 2007 when he took the ball 23 times... Allowed three earned runs or less in 15 of his 21 starts, posted 139 SO to just 54 BB and limited opposing hitters to a .210 (88- for-419) average... Averaged 10.94 SO/9 IP, the fourth-best mark by a rookie all-time (minimum 20 starts)…Kerry Wood posted a 12.58 mark in 1998, followed by Dwight Gooden (11.39 in 1984) and Hideo Nomo (11.10 in 1995)... 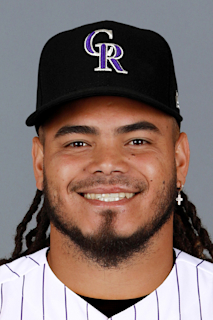 Among pitchers with at least 20 games started this season, Lamet's 10.94 SO/9 IP ratio ranked eighth in the majors and fourth in the NL, behind only ARI's Robbie Ray (12.11), WSH's Max Scherzer (12.02) and LAD's Rich Hill (11.01)… his .210 opponent batting average ranked ninth in the majors and fifth in the NL... Made his MLB debut on 5/25 at NYM at Citi Field, tossing 5.0 IP of one-run ball, allowing just three hits and striking out eight in the Padres' 4-3 victory…became only the second player in club history to earn the win and strike out at least eight in their MLB debut...LHP Bob Shirley earned the win and struck out 11 in his 8.2 IP on 4/10/77 at CIN (ELIAS)... In his next start, he improved to 2-0 in his Petco Park debut on 5/30 vs. CHC, tossing 5.0 IP of two-run ball, allowing five hits and one walk while striking out eight in the Padres' 6-2 victory…per ELIAS, with his eight strikeouts, he became the first rookie since 2014 to fan eight batters in each of his first two MLB starts since NYY's Masahiro Tanaka in 2014…he was the 13th rookie to accomplish the feat in the modern era (1900-present)... Struck out a career-high 12 batters in his start on 6/17 at MIL, the second-highest single-game total by a Padres rookie in franchise history, behind only Oliver Perez's 13 on 7/7/02 at COL..the 12 strikeouts matched the highest single-game total by any rookie this season (also: CIN's Amir Garrett on 4/19/17 vs. BAL)... Earned the win in three consecutive starts from 7/23-8/6, posting a 1.96 ERA, 18 SO against six BB and a .172 opponent batting average…joined Jhoulys Chacin and Luis Perdomo as the only Padre hurlers to earn a win in three consecutive outings in 2017... Allowed three earned runs or less in 10 consecutive starts from 7/23-9/13, just the fifth Padres starter to allow three earned or less in at least 10 straight since 2015…over the stretch, he went 4-3 with a 2.44 ERA (16 ER, 59.0 IP) with 66 SO to 28 BB with a .185 opponent batting average... Limited right-handed hitters to a .155 (32-for-206) average while lefties hit .263 (56-for-213)... Allowed 11 home runs in his first nine starts from 5/25 to 7/18 and seven over his final 12 starts from 7/23 to 9/26. February 21, 2019 San Diego Padres placed RHP Dinelson Lamet on the 60-day injured list. Recovering from Tommy John surgery. October 30, 2018 San Diego Padres activated RHP Dinelson Lamet from the 60-day disabled list. April 14, 2018 San Diego Padres transferred RHP Dinelson Lamet from the 10-day disabled list to the 60-day disabled list. Right elbow strain. March 28, 2018 San Diego Padres placed RHP Dinelson Lamet on the 10-day disabled list retroactive to March 26, 2018. Right elbow strain. May 25, 2017 San Diego Padres selected the contract of RHP Dinelson Lamet from El Paso Chihuahuas. February 10, 2017 San Diego Padres invited non-roster RHP Dinelson Lamet to spring training. August 24, 2016 RHP Dinelson Lamet assigned to El Paso Chihuahuas from San Antonio Missions. June 6, 2016 RHP Dinelson Lamet assigned to San Antonio Missions from Lake Elsinore Storm. April 5, 2016 RHP Dinelson Lamet assigned to Lake Elsinore Storm from Fort Wayne TinCaps. May 29, 2015 Fort Wayne TinCaps activated RHP Dinelson Lamet from the 7-day disabled list. May 22, 2015 Fort Wayne TinCaps placed RHP Dinelson Lamet on the 7-day disabled list. April 5, 2015 RHP Dinelson Lamet assigned to Fort Wayne TinCaps from DSL Padres. August 20, 2014 RHP Dinelson Lamet assigned to DSL Padres.